Beginning in 2010, Cassini began a seven-year mission extension in which it completed many moon flybys while observing seasonal changes on Saturn and Titan. The plan for this phase of the mission was to expend all of the spacecraft’s propellant while exploring Saturn, ending with a plunge into the planet’s atmosphere. In April 2017, Cassini was placed on an impact course that unfolded over five months of daring dives—a series of 22 orbits that each pass between the planet and its rings. Called the Grand Finale, this final phase of the mission has brought unparalleled observations of the planet and its rings from closer than ever before. 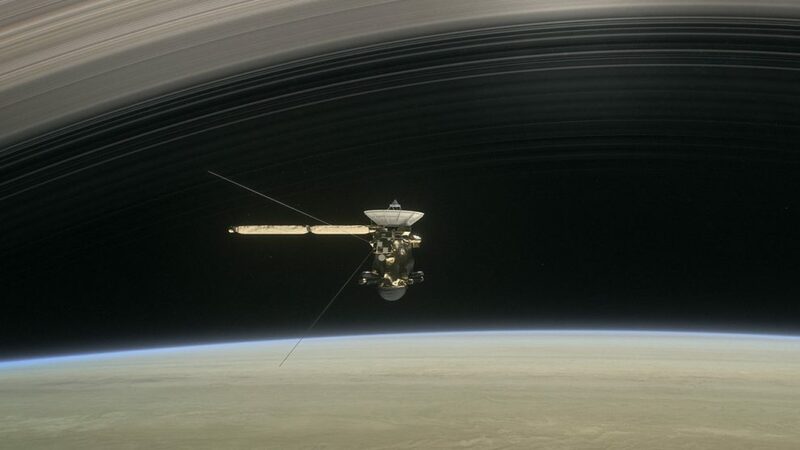 Since April 2017, NASA’s Cassini spacecraft has been writing the final, thrilling chapter of its remarkable 20-year-long story of exploration: its Grand Finale. A final close flyby of the moon Titan on April 22 used the moon’s gravity to reshape Cassini’s trajectory so that the spacecraft leapt over the planet’s icy rings to pass between the rings and Saturn. During 22 such passes over about five months, the spacecraft’s altitude above Saturn’s clouds varied from about 1,000 to 2,500 miles (1,600 to 4,000 kilometers), thanks to occasional distant passes by Titan that shifted the closest approach distance. At times, Cassini skirts the very inner edge of the rings; at other times, it skimmed the outer edges of the atmosphere. During its final five orbits, its orbit passes through Saturn’s uppermost atmosphere, before finally plunging directly into the planet on Sept. 15.